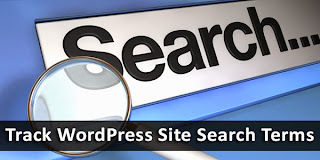 How To Track Site Search Terms in WordPress? Google is one of the largest search providers, and almost every website that has a search widget is using Google Search to power the widget. This is especially true for blogs, since users site search on blogs more often than on websites. Finding out what users are searching for before landing on your website is extremely important. But so is finding what users are searching for within your site. The former can easily be gathered through Google Analytics, but what about the letter? You can use the Google Site Search tool to find out what people are entering in your WordPress search widgets. Why do you need to find out what search terms people are entering in your search widget? Because you just have to! People use your site's search bar if they find your content interesting, and want to look for more stuff from within your site, without having to search Google. So these users are 'priority' users, and it can pay off to see what they want and expect from your website. You can use this insightful information to build content strategies around user expectations, and more! To start tracking search terms on your site, you will first have to find out the query parameters for your website. For WordPress, it is typically an 's'. For example, if I run a site search for "Hello World" on my site, the URL would look something like http://example.com/?s=hello+world. Anything between the ? and the = is your query parameter. A site might have more than one search query parameters. Now, follow the following steps to activate tracking. Click on View Settings button under the View (Profile) section. Entry all your query parameters, and then save your changes. You have now successfully set up Site Search Tracking. To check the results from this tracking, go back to your Google Analytics account. Go to Content > Site Search to get the scoop on search terms people use on your site. It might take 24-49 hours for this option to appear. terima kasih sudah berbagi info kang, saya nyimak saja.